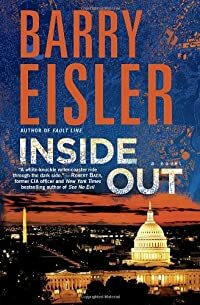 Inside Out by Barry Eisler, a Mysterious Review. Review: After a collection of sensitive videotapes are stolen from the US government, and held for ransom — $100,000,000 in diamonds else they're posted online — undercover operative Ben Treven is assigned to retrieve them in Barry Eisler's political thriller Inside Out. The videotapes are of sessions in which US interrogators tortured prisoners taken in the war on terror. All the "alphabet" agencies (FBI, CIA, NSA, etc.) are scrambling their own agents to recover them — and of course, no one agency is cooperating with any other — with the JSOC (Joint Special Operations Command) tapping Ben. It turns out this is prescient move as the person who took the tapes is former JSOC operative Daniel Larison — a man everyone presumed dead, killed years earlier while on a clandestine operation in Pakistan. Ben follows Larison's trail to Costa Rica, and even though they've never met, each man has similar training and skills, giving neither an advantage over the other. It quickly becomes a deadly game of cat-and-mouse to determine which of the two men will prevail over the other. ... the exceedingly flawed ending. The storyline essentially concludes at about the 300 page mark, but is then succeeded by a long, divisive, politically partisan State of the Union message. True, it's given by one of the book's characters … but it really isn't. Eisler follows this lecture with pages and pages of references to support his assertions and arguments. Whether one agrees or disagrees with what is presented as fact is not the point; what is, is how it is incongruously included in a fictional context, appended to the end of an otherwise highly entertaining suspense novel, when it should have been framed as an afterward or better yet, omitted entirely. It's fine to have a political slant to a plot, but at the very least be creative and make it interesting. And to be fair, elsewhere in the book, Eisler's points are unambiguously made in a proper, contextual manner that doesn't detract from the overall story arc. But in the last 20 pages or so, his political point of view is tendered with such graceless brute force that all one gets from it is a steep crashing dive from what was only a few pages earlier a thriller high. Acknowledgment: Random House provided a copy of Inside Out for this review.